Over 2 million children reside in single-parent families.4) Never married single mother families constitute the greatest portion of single parent families. 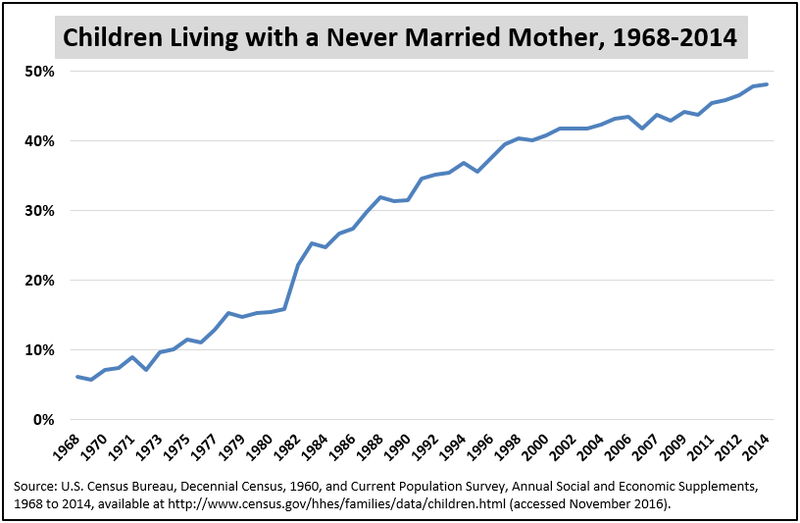 While the share of divorced and separated single mothers has decreased in recent years (although the numbers are still high), the share of never married single mothers continues to rapidly rise.5) This trend is particularly alarming because, of all family structures, children of never married mothers are the most likely to experience poverty. 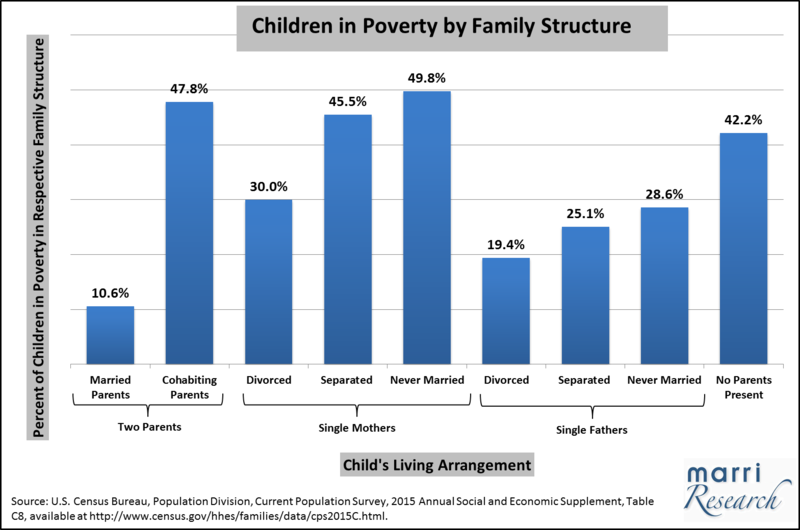 In 2015, 49.8 percent of children under age 18 who lived with a never married mother were in poverty.6) It is also notable in the chart above that cohabitation seems to make little difference in lowering the poverty rate. 1) $22 trillion in constant 2012 dollars; Robert Rector and Rachel Sheffield, “The War on Poverty After 50 Years” Heritage Foundation Backgrounder No. 2955 (September 2014), http://thf_media.s3.amazonaws.com/2014/pdf/BG2955.pdf (accessed November 2016). 2) U.S. Census Bureau, “Historical Poverty Tables: People and Families 1959 to 2015,” Poverty Status of People, by Age, Race, and Hispanic Origin Table 3, http://www.census.gov/data/tables/time-series/demo/income-poverty/historical-poverty-people.html (accessed November 2016). 3) U.S. Census Bureau, Current Population Survey, 2015 and 2016 Annual Social and Economic Supplements, “Table 4: Families in Poverty by Type of Family: 2014 and 2015”. 4) , 5) U.S. Census Bureau, Decennial Census, 1960, and Current Population Survey, Annual Social and Economic Supplements, 1968 to 2014, available at http://www.census.gov/hhes/families/data/children.html (accessed November 2016). 6) U.S. Census Bureau, Population Division, Current Population Survey, 2015 Annual and Social Economic Supplement, Table C8, available at http://www.census.gov/hhes/families/data/cps2015C.html (accessed November 2016). 7) U.S. Census Bureau/ American FactFinder, B19126: Median Family Income in the Past 12 Months (in 2015 Inflation-Adjusted Dollars) By Family Type by Presence of Own Children Under 18 Years), 2015 American Community Survey 1-Year Estimates, available at http://factfinder.census.gov/faces/tableservices/jsf/pages/productview.xhtml?src=bkmk (accessed November 2016). 8) Daphne Hernandez and Kathleen M. Ziol-Guest, “Income Volatility and Family Structure Patterns: Association with Stability and Change in Food Stamp Program Participation,” Journal of Family and Economic Issues 30, no. 4 (2009): 366. As cited in Patrick F. Fagan, Andrew J. Kidd, and Henry Potrykus, “Marriage and Economic Well-Being: The Economy of the Family Rises or Falls with Marriage,” (May 2011). Available at http://marri.frc.org/get.cfm?i=RS11E03. Accessed 20 July 2011. 9) , 10) U.S. Census Bureau, Current Population Survey, 2016 Annual Social and Economic Supplement, Table C8, available at http://www.census.gov/hhes/families/data/cps2016C.html (accessed November 2016). 11) Patrick F. Fagan, Robert W. Patterson, Robert Rector, “Marriage and Welfare Reform: The Overwhelming Evidence that Marriage Education Works,” Heritage Foundation Backgrounder #1606 (October 2002), available at http://www.heritage.org/research/reports/2002/10/marriage-and-welfare-reform (accessed November 2016). 12) M. Anne Hill and June O'Neill, “Family Endowments and the Achievement of Young Children With Special Reference to the Underclass,” Journal of Human Resources, Fall 1994, pp. 1090-1091. 13) Mary Corcoran, Roger Gordon, Deborah Loren, and Gary Solon, “The Association Between Men's Economic Status and Their Family and Community Origins,” Journal of Human Resources, Fall 1992, pp. 575-601. 15) Wendy Manning and Kathleen Lamb, “Adolescent Well-Being in Cohabitating, Married, and Single-Parent Families,” Journal of Marriage and Family, Vol. 65 (November 2003), pp. 876–893. 16) Chris Knoester and Dana L. Haynie, “Community Context, Social Integration Into Family, and Youth Violence,” Journal of Marriage and Family 67, no. 3 (2005): 767-780. 17) Samuel W. Sturgeon, “The Relationship Between Family Structure and Adolescent Sexual Activity,” Heritage Foundation FamilyFacts.org Special Report No.1 (November 2008), available at http://www.familyfacts.org/featuredfinding/ff_01.pdf (accessed November 2016).